As high-end customers are stricter with themselves, luxe sport is required. Tailor sports and outdoor business seem contrasting but combine together in this season. People pursue delicate sports experience, with bold, intense colors and high-tech sporty patterns widely used on printed knits, outdoor wear and workout clothes. These elevated and emotional looks inspire people to escape from the modern society, but connect with it closely at the same time. The Power of Walking：When the noble luxury meets sports, what would it brings? With leading brands exploring the sports products, the customized and individual sport mode are favored by the high-end customers. In the current craze of sport campaign, nobody can resist the charm of sport. 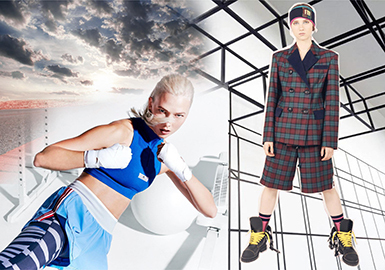 The intense sport-inspired colors highlight the feminine flair of womenswear and convey the sporting spirit.